Hey guys! I wanted to share some images from "Masters of Sketching" by 3DTotal. The book is available for preorder. The book is 272 pages long and includes tutorials from myself along with some pretty amazing artists! All preorders come with a free sketching bundle. The book will be available on December 5th <. arti. dfgdfgdfgdfgd. werwerwerwerwerwerwerwerwrwerwersdfsdfsdfsdfsfdsfsfdsfdsfsfssdfsdfsdfsdfsdfsfsf. HAPPY AMERICAN ELECTION DAY. Let's not talk about it. Instead, I have a garbage review of some cheap paper for you! I've found that sometimes, the cheapest materials out there are all you need. Like hot dogs. You don't need Châteaubriand and caviar every day. (Maybe I don't need hotdogs everyday either but let's stay on topic) In a world of spectacular art materials, a sheet of basic copy paper and a Bic pen, which together cost less than pocket lint, are still fantastic tools. Perhaps you can't paint the Sistine Chapel with them, but they are more than sufficient enough to sketch out the idea with. Being cheap doesn't always mean being bad. Recently, like a plague of Kudzu overtaking the interstates of eastern America, I've seen more and more of these Canson XL pads cropping up anywhere that sells art supplies. And like most other aspiring artists out there, I still hold out hope that there is a secret set of materials that, if found, will do all the hard work of painting for me. All I have to do is find it and the fountain of youth, a comfy chair, and I am set! To this end, I often try out a lot of the new stuff, regardless of wether or not it is being marketed towards students, weekend watercolorists, or panda bears. Canson's student grade XL series offers a variety of paper types, Bristol, Drawing, Mixed Media, Watercolor, Sketching, and so on. All of which are priced amazingly low compared to other similar papers on the market. They are also all recycled and made using sustainable means and whatnot. So you can feel smug and superior to everyone else while you draw. I gave each of the papers a try (since they are basically free). They all feel surprisingly okay to work on and do a serviceable job at what they are marketed for. I was most impressed with the Mixed Media paper. While it has not done anything for me as far as mixed media goes, it was wonderful to draw on. One of the more interesting aspects of the XL paper, is that each page offers 2 separate drawing experiences on the front and back. One side is smooth and the other offers more texture. For testing out their wet media I picked up a pad of the XL Cold Press Watercolor Paper. I'll be honest: I usually hate cold press paper. It is often absurdly textured, as if painters only ever wanted to paint on cinder blocks or tree bark but were duped into using smooth papers by the Illuminati and Lizard people. However, Canson's XL paper is a very lightly-textured cold press, and actually feels a bit like something in between a Fabriano hot press and a more Strathmore cold press. So it works great for someone who prefers something in between. So how does it handle? I like how it takes pencil and I love how laying in initial colors feel on the paper. Paint goes on smooth and can be pushed and pulled rather easily. It allows a little bit of lifting out of light colors, and dark colors can be pulled out all together if you like. This is great if you don't care too much about using very wet washes and you prefer to noodle the colors around as you paint. (As someone who probably applies too many washes this is annoying, but that is why I tend to work on vellum bristol over cold press papers in general anyway). Bottom line: if you like watercolor paper that behaves like watercolor paper, it does the job. As far as a purely watercolor paper goes, Canson's XL cold press paper is a lot fun and I would recommend the paper if you are looking for something basic and affordable to work with every now and then. If you plan on painting the Sistine Chapel, I might recommend some of the heavy hitters of the watercolor world, but at a tenth of the price, this is a great alternative. If you do want to try some of the more expensive papers with similar feels to them, try out Fabriano's 300g Hot Press paper, Strathmore's 500 series illustration board for wet media, and Canson's own Montval Cold Press. Note 1: In closing, I should note here: Materials are important, but they aren't THAT important. A good artist could work on anything, even tree bark and it would still be impressive. But what materials can do is make your life easier and may allow you to better play to your strengths as an artist. However, there is no silver bullet or secret formula that can make up for lack of practice and technical ability. Mission Blue is a project developed by Sylvia Earle to create "Hope Spots" around the globe within our oceans. These areas act as nature reserves, letting them heal and regenerate. The intention of this show is to bring awareness and to raise funds for this charity. My contribution is "Red Deep". A piece inspired by the endangered Deepwater Redfish, an amazing creature that can live up to 75 years in the wild. Fisheries are the main threat to the survival and recovery of the species. The opening will be October 29th from 6-8pm. Gallery Gerard will be in Reading, PA at the Goggleworks center for IlluXCon 9. Here are the brand new pieces we will be debuting at the show this year. New MC post on Watercolor and Acrylic! 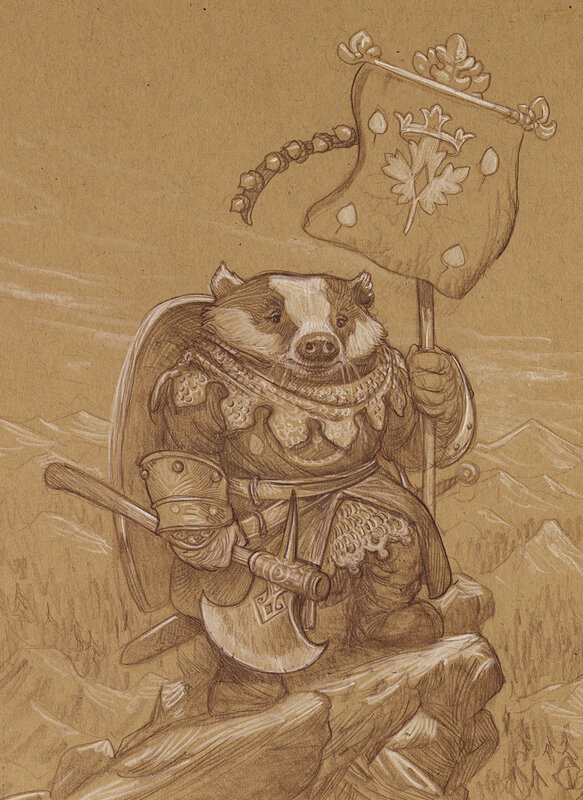 We've got a new post today on taking this fine fellow from rough sketch to finished painting. Check it out on Muddycolors! Hey guys! "The Gryphon Hunters" and "Fairy Tales and Folklore" shipped out on Friday. Thank you all SO MUCH for making this such a successful 2016 sketchbook release. While all of the limited edition books have been sold, we still have some of the standard edition books in our shop! Come see our work at Gallery Nucleus SEPTEMBER 17 from 7-10PM in celebration of the 30th anniversary of the 1986 fantasy film, Labyrinth. There will be over 35 original art pieces paying tribute to this Jim Henson classic. Cory Godbey's new book "Labyrinth Tales" will also be available for purchase. If you live in the Atlanta area, be sure to check out the Center for Puppetry Arts special Labyrinth exhibit. They will be holding a costume contest judged by Brian Henson, Chairman of The Jim Henson company. We will be participating in Gallery Nucleus' Labyrinth 30th Anniversary tribute show next Saturday. Here are some sneak peeks of the paintings we will be exhibiting! We are home from DragonCon! It was my 7th year attending this event, and Justin's 4th. We had such an amazing time at the show this year. Thank you so much to those of you who came to see us this past weekend. I can't believe it will be a whole year before I see some of you again! This year's show had some of the most memorable moments of any convention we have ever attended. We even got to play a small part in a marriage proposal in front of our booth. As with every art show we attend, we come home with fresh inspiration and ideas for new projects. I have found that being surrounded by so many artists and beautiful paintings is very nurturing to the creative process. Justin was able to thumbnail out a project we are thinking of starting next year while working the booth (I'm super excited for this one). Another highlight this year is that "Moonlight Parade" won Best in Show. I am so honored to have one of my favorite pieces recognized. A special thank you to the jurors Daren Bader, Stephan Martiniere, and Scott Fischer, whom are all artists I look up to greatly. Its always a little sad when a show comes to a close. As artists and introverts, we tend to stay at home most of the time. We paint all year, and at art shows like this, we are finally able to reveal our endeavors to the world. It is both terrifying and wonderful. I feel like I can't say it enough, but thank you again for your support over the years. It is still amazing to me that we are lucky enough to be able to have a job that we truly love. 2016 Sketchbook PRE-ORDERS are LIVE! The pre-orders for both the standard editions and Limited Editions of our 2016 Sketchbooks are now available in our store! ALL pre-orders received before September 1, 2016 will receive a bonus matted and hand-signed 5"x7" mini-print FREE! This year, Justin is offering 50 and Annie is offering 25 Limited Edition copies. 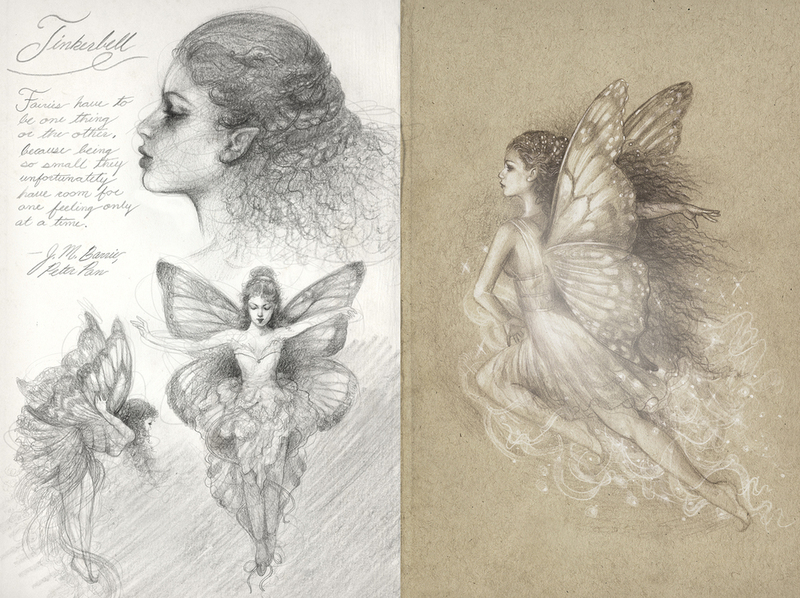 Each Limited Edition Sketchbook includes an original drawing by the artist on the title page. Check out some of last year's original drawings here! Each Limited Edition copy is hand-signed and numbered and comes with a separate signed and matted 5"x7" mini-print. SHIPPING: All Pre-orders are scheduled to be shipped out by August 29, 2016. All books are sleeved and shipped in sturdy mailer boxes for increased durability during delivery. Please allow 2 weeks for Continental U.S orders and 3 weeks for International orders to arrive. Also! For those of you who plan to attend DragonCon in Atlanta, GA on September 2-5, we will be offering advance copies of our Standard Edition Sketchbooks for sale! PAYPAL Orders: We've received many requests to allow customers to pay with Paypal, and we've heard you. So this year, we are offering an Etsy listing for both our Standard and Limited edition sketchbooks which will accept PAYPAL at checkout. Check out our Etsy for more information. "A Villainous Gentleman", inspired by J.M. Barrie's novel "Peter and Wendy". Most of the time I try to provide, thoughtful, in-depth, considered blog posts that are hopefully informative, thought-provoking and interesting. Well today I'm taking a break from all that to bring you some shameless self-promotion. No more salad and steamed vegetables, it's time for cheeseburgers made of donuts and bacon! Today I'm sharing a preview of Annie and I's Sketchbooks for 2016, which will be available for pre-order August 25! For Justin's sketchbook, this year will feature many gryphons, dragons, dwarves, orcs, and all manner of pestilence and assorted villainy. As with previous years this sketchbook will include a great deal of development sketchwork as well as finished paintings. It gives an overview of the development procedures that go into designing and illustrating the scenes I paint. Both books will be available for pre-order on August 25 at 12 noon EST from our shop. Each book in this limited run is hand-signed and numbered by the artist and will ship in September. And as with previous year's book we will be offering a limited edition run of books with a hand-drawn original inside. We hope you will drop by to take a look on the 25th! Come see Gallery Gerard at GenCon in the Art Show Booths 12&13. We will have original paintings, canvas giclees, prints, books, original drawings, and more! "Snow-White longed for the beautiful apple, and when she saw that the peasant woman was eating part of it she could no longer resist, and she stuck her hand out and took the poisoned half. She barely had a bite in her mouth when she fell to the ground dead."